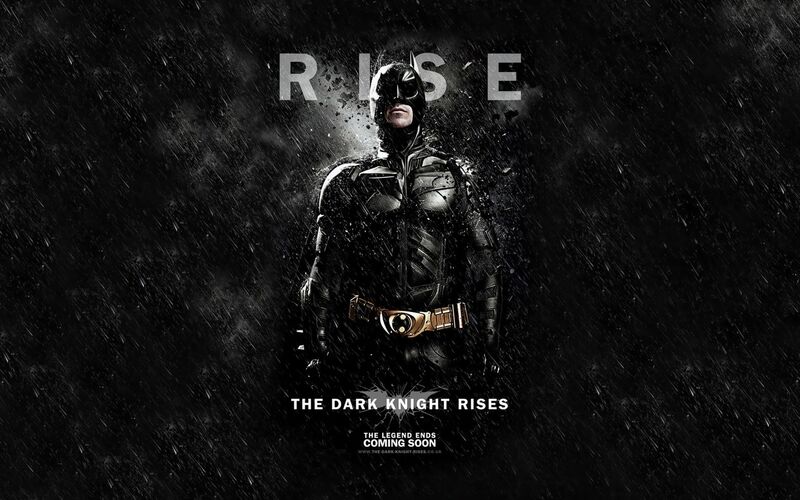 “The Dark Knight Rises”- A Christian Reflection | J.W. 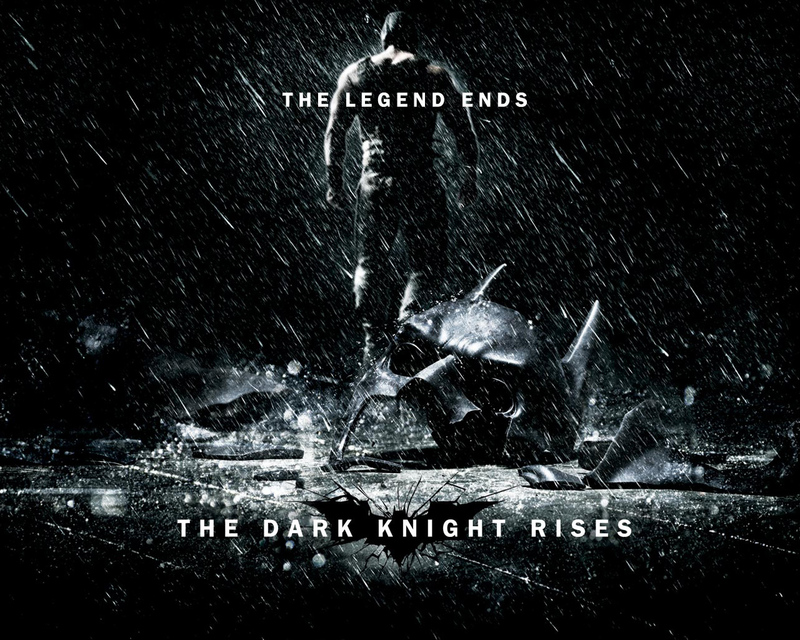 Wartick -"Always Have a Reason"
The epic tale begun with Batman Begins and continued with The Dark Knight comes to a fruition in The Dark Knight Rises . Batman has always been my favorite hero (I say hero and not superhero because he has no superpowers), and I couldn’t wait to see the finale to the trilogy I had been awaiting for some time. It didn’t disappoint. Herein, I reflect from my Christian background on the many themes in the movie. Here’s the last warning: THERE ARE SPOILERS HERE. BIG ONES. I’m going to eschew giving a plot summary because what I want to contribute to the conversation is a discussion on the themes. If you don’t feel like bothering with the movie, it would be good to at least know about the plot before reading this post. Check here for a brief summary. Throughout the movie I kept noticing faith as a major theme. There were those who had maintained faith in a lie: Harvey Dent. Batman had taken the fall for him in The Dark Knight in order to provide Gotham with a needed hero. This faith was misplaced, and Jim Gordon, the police commissioner of Gotham City, almost destroyed himself keeping it inside himself. He said, at one point, “I knew Harvey Dent. I was his friend. And it will be a very long time before someone… Inspires us the way he did. I believed in Harvey Dent.” Yet the whole time Gordon knew he was speaking a lie. He believed in Dent, but he no longer believes in him. Batman placed his faith in Catwoman/Selina Kyle. He firmly believed that there was more to her than the anger she continually expressed. This interplay was made more interesting by the interaction between Batman’s and Catwoman’s alter egos, Bruce Wayne and Selina Kyle. Selina Kyle, who seemed generally upset with all the rich and famous in Gotham and the decadence found therein–told the rich billionaire Bruce Wayne, “You think this can last? There’s a storm coming, Mr. Wayne. You and your friends better batten down the hatches, because when it hits, you’re all gonna wonder how you ever thought you could live so large and leave so little for the rest of us.” More on the interaction between the two later. Alfred put his trust in Bruce Wayne. He strongly wanted Wayne to have a satisfying, fulfilling life, and throughout the film he worried that Batman would destroy Wayne. When push came to shove, Alfred was willing to leave Wayne in order to try to save him. Again, more on this later. Finally, there were those who had faith in Batman. Batman, to them, was more than just a hero, he was a symbol of hope and justice. One thing viewers should note is that the use of “faith” in The Dark Knight Rises is not some kind of hack definition. It doesn’t mean “belief in the face of insurmountable evidence to the contrary” or “belief in something you know ain’t true.” Instead, faith in the movie is faith in–a trusting faith based on evidence. Those who believed in Harvey Dent were mistaken, but that wasn’t due to evidence, it was active deception. Batman’s faith in Selina Kyle was firmly based on his ability to read her character. Others’ faith in Batman was based upon either a personal knowledge of the secret (Gordon) or knowledge of his actions as Batman (John Blake, others). It is very similar to the faith of the Christian, which is based upon knowledge. The most obvious theme in the movie was that of “arising.” Bruce Wayne had to overcome his doubts, fears, and become something greater. Yet he had to rely on others to build this journey. The knowledge of his fellow prisoners in ‘the pit’–a prison into which people were thrown, but could climb out. Only one had ever managed it, however, and that was Ra’s Al Ghul’s daughter, who had subsequently saved Bane. Ironically, then, the rise of his enemies forced the Dark Knight to meet their challenge. He had to transcend his limits and become that which Gotham needed in order to save it. Yet Batman/Wayne wasn’t the only one who rose in the movie. Selina Kyle also experienced a major transition. As a character, she was initially powerfully motivated by anger and a desire to escape. She was portrayed as being very frustrated and angry with the social imbalance of the world and determined to not only try to balance it–in her favor, of course–but also to punish those who made it so imbalanced. When Batman returns to Gotham after his exile by Bane, he confronts Selina. He points out that the storm she predicted earlier has hit, and it doesn’t seem like it was what she wanted. Still, however, she seems determined to be in it all for herself. Yet ultimately she comes back to fight with the Dark Knight against the evil powers that are trying to destroy Gotham. In the end, she does manage to rise, with the guidance and help of Bruce Wayne/Batman. John Blake–the incorruptible cop–also rose. It is revealed shortly before the film’s end that he is Robin–and that he is about to take up the cowl of Batman, to become the symbol for Gotham. Here, I sensed a feeling of fulfillment. We encourage others to walk in our shoes and left them up when they are down. Without Batman, Blake would not have survived. Yet he goes on to [presumably] become the next Batman, to save others. The world is not all sunshine and daisies. The world is full of corruption and sin. 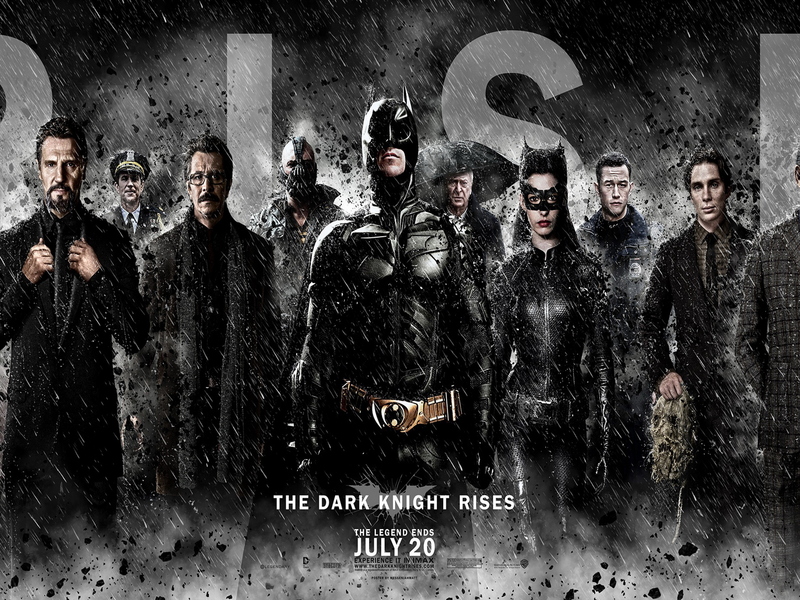 Interestingly, The Dark Knight Rises has much less corruption on the part of the police force than the previous movies. The turn was a noticeable, perceptible shift. As far as the plot goes, I wonder if any of that was due to the “Dent Act” which effectively ended organized crime in Gotham. Despite the relative “cleanness” of the police force, however, there was plenty of corruption to go around. Once Bane overthrows the city, there are “people’s courts” where “justice” is dole out on those already deemed guilty. The prisons are ripped open due to the lie [Harvey Dent] that many were imprisoned by. One wonders, how much of this is justice? Is any of what Bane says true? Furthermore, it is a powerful reminder of the human condition. Given the chance to rule themselves, Gotham erupted into violence and brutality. It is little wonder that this should happen, given a Christian worldview, because all are sinful and need grace. All deserve justice. Is there justice? Was Batman just in continuing his adventures as the Caped Crusader? Is violence ever a justifiable means to an end? Within Christianity there is a long history–traceable to Augustine, at least–of the concept of a “Just War.” There will be much debate over whether the actions of someone like Batman could be justified. Is it ever permissible to take justice into one’s own hands? I leave the question open. Yet more important questions loom. What is justice? Who is to determine it? One wonders what worldview could plug these holes that continue to open as human nature is probed by director Christopher Nolan throughout the Batman Trilogy. From the irrational desire to cause fear and anarchy of Scarecrow to the anarchist nihilism of the Joker to the over-reactive retribution of Bane, Nolan has exposed viewers to the depths of human freedom. What price, freedom? Bane tells Gotham he has set them free, yet he has truly imprisoned them by their own nature. What occurs is a vivid portrayal of human nature and destruction. I can’t help but think of Bruce Wayne’s ascension from the pit to the chants of “rise” without thinking of the Christian faith. We sinners are in our own pits of sin. Yet just as Wayne we have a very real lifeline. Yes, Bruce Wayne shunned the physical lifeline, but he clung to an idea: he clung to faith. Similarly, the Christian shuns the physical realm and is saved by faith. Rise. There is the notion of a “clean slate.” Selina Kyle is primarily motivated by her desire to have such a clean slate. She wants to start over. Batman offers it as a tantalizing price to pay for her help in the final battle. Yet in the end, Selina comes back and redeems herself more than was required by the Bat. At the end of the movie, however, it is revealed that both Bruce Wayne and Selina Kyle have managed to use the “clean slate.” They have started afresh. Again, a Christian allegory or overlay could be applied here. We are all sinners in search of a clean slate, yet we cannot provide it for ourselves. While have no nearly-magical technology to give us a clean slate, we do have salvation by grace through faith. And that, my friends, is something worth considering. Finally, Wayne’s “rise” coincides with the need I described earlier. The fact that enemies had arisen meant that Batman had to also rise to the challenge. Christians know that once sin came into the world, the only way to cure it would be for God to come into the flesh to save us. Such is poignantly portrayed when Jim Gordon talked to John Blake. Gordon talks about the evils of Gotham and describes how Batman transcends the filth, but he “puts his hands into the filth [with us]” [I believe he says filth, but I have a suspicion it may have been muck–correct me if I’m wrong here]. Wayne, though having no obligation to these people, still loves Gotham, and he is willing to condescend to get his hands dirty–to put his hands into the filthy muck and dirty them in order to save it. Is it an allegory? It certainly works as one. Jesus is God incarnate. A God who loved His creatures so much that He was willing to become one of them–to put his hands into the filth and reach down to save us. Just as Batman did what was necessary to save while also dealing justice, Christ did what was necessary in order to save humanity from its own sin. The Son Rises. Check out more of my reflections on movies. If you liked The Dark Knight Rises, check out my look at The Avengers. >once sin came into the world, the only way to cure it would be for God to come into the flesh to save us. Why is this the only way God could have handled the situation? Because sin can only be made clean by blood sacrifice. This is why for centuries, humans sacrificed lambs and other animals to God, to pay for our sins. To do away with this, God decided to pay our debt for us. No man can be perfectly sinless, therefore he is guilty of sin. God had to become a man, to live a perfect life, and die on the cross to become the final sacrifice for that sin. That way, all who believed in Him would be free from their sin. This sells God short. He can accomplish any logically possible thing via any means. In this light, when God chooses a method that includes suffering, pain or blood, it seems it is not because it is necessary. If it is not necessary, why not choose a kinder way? Calvary suggests Yahweh demands blood when it is not necessary. We can just trust that He knows what He’s doing, but that way seems blocked by God’s omnipotence. God is very clever and has options. There is no contradiction in saying God could have just forgiven us without the gruesome spectacle of the Cross. You write, “There is no contradiction in saying God could have just forgiven us without the gruesome spectacle of the Cross” as though you know the very nature of God and justice. I’m curious: how do you know this? Why was this the only way God could handle the situation? I worded that poorly. However, what I meant was that the Incarnation was a [the?] way to preserve divine justice and love. This was one of the best movies I have ever seen! Tied in the first two so well and added a realistic depth to the comic characters making them not over the top,or of unbelievable origins, but completely believable and realistic. Absolutely blew my mind what Christopher Nolan and the other writers did with this story. Bain sounded kinda like a bad Sean Connery impersonation though lol, although I honestly loved his voice and it added a lot to his character. Sean Connery! That’s what I was trying to land on. I knew he sounded like someone! Anyway, I agree. The trilogy was finished off very, very nicely. Batman is a very believable hero, and the villains used here are also believable. I think that adds to it.